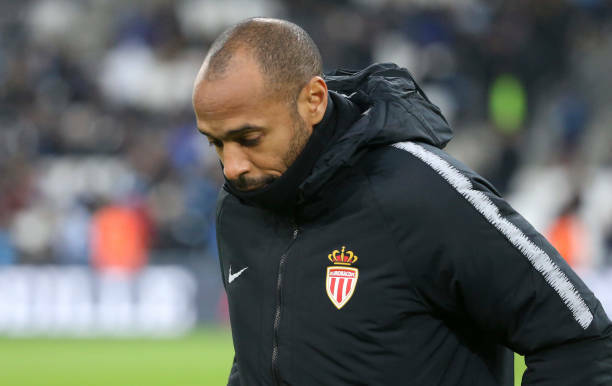 Former Arsenal striker Thierry Henry has been suspended by Monaco and appears to lose his job as coach after only three months in charge at the Ligue 1 club. The 2017 French champions are in the relegation zone after only five wins under Henry in all competitions. Arsenal’s all-time leading scorer is in his first managerial role, having previously been Belgium assistant boss. “Monaco have decided to suspend Thierry Henry, until a final decision (on his future) is made,” the principality club said in a statement. Jardim is expected to be unveiled for a second spell after agreeing terms on a two-and-half-year contract, according to report. The Portuguese coach led Monaco to the Ligue 1 title in 2017, the same year they reached the Champions League semi-finals, before being sacked after a poor start to the current season. But under Henry they sit second from bottom in the table and were also knocked out of the French Cup in the last 32 by Ligue 2 side Metz on Tuesday.